about a hundred miles beyond the Scottish mainland. Although Shetland is on the same latitude as the southern tip of Greenland, it has a fairly mild oceanic type of climate thanks to the effects of the Gulf Stream. Lerwick, the capital, is on the east side of the Mainland and is nearer to Bergen in Norway than to Aberdeen and holds about a third of the islands’ population of 22,000. It is here that the passenger ferries sail and dock with great regularity. Scalloway, the old capital, is on the west side of the same island and is well known as the port chosen by the Norwegian resistance as a base for ‘The Shetland Bus’ operations, which saved many lives during the Second World War. Shetland is made up of 14 inhabited islands and dozens of uninhabited islands, that is uninhabited by humans, but desirable places for wildlife. A good example is Mousa, a small island close to Sandwick in the south Mainland. It has an estimated 6,800 nest sites of storm petrel and many of these are in the walls of the old Pictish broch, Britain’s most complete Pictish fortress. Another example is the island of Noss, near Bressay with its towering sandstone cliff where countless thousands of seabirds nest each year. This island is a National Nature Reserve and is one of the most spectacular sights in Shetland. Yell, Fetlar and Unst, the ‘North Isles’ each have their own special wildlife attraction. Yell was the location for the first ever film featuring wild European otters. 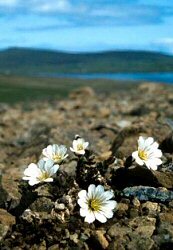 Fetlar is home to the delightful red-necked phalarope and Unst has a plant found nowhere else in the world called Shetland mouse-ear. Unst is as far north as you can get in Britain.